We do not know much about Jan Kotik, the man who took those photos. He was a soldier, he had a camera with him, and, by recording individual pictures on the glass film, he was building a war narrative. 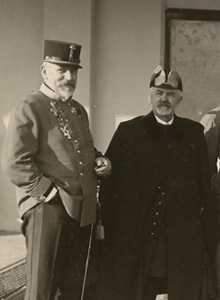 The main characters were soldiers of the Austrian-Hungarian army, somewhere in the Monarchy’s outskirts during World War 1, and the civilians, almost always accompanied by soldiers. We do not know whether these are all the pictures Kotik took at the time, or, whether the collection is a coherent whole. The few-digit numbers you can spot here and there suggest that there were many more such pictures, and what we are left with is but a random selection. 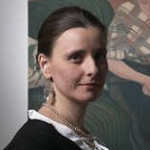 It was time and the collection’s history of almost a hundred years – and one that we don’t know, either – that have constructed the collection. The pictures’ author made his best to make them serve others in a best way possible. He would stick them onto pieces of cardboard sheet, and caption them carefully. Typewritten texts on separately adhered slips of paper: time and place the photo was taken, and the characters mentioned in the captions, complement their corresponding pictures. Interestingly, those texts bear traces of ‘proofreading’. Red ink was used to fill in the misprints; an event has been rendered more precise, an abbreviation corrected. One of the photographs is stamped: the press office of the k.u.k. Ministry of War admitted it for publication. When looking carefully at those pictures, we can easily spot descriptions made on the glass films’ edges. They were copied as part of the contact process, as the prints were made. Numbers can be read out of them, along with geographical names: Flamm, Tyrol, Belgrade; names of officers sometimes appear there, too. This testifies to the author’s accuracy, whilst facilitating the pictures’ analysis. But those pictures might have well existed on their own, being readable without captions, for it is the images recorded by Kotik that provide most of the information to us. However, the textual layer is indicative of that the collection was prepared to play a more widespread and more important part than being a mere souvenir of the war. The author certainly did not intend to take some pictures for his family album, as a means of recollecting his war years. The pictures are from the First World War, but the war itself – the one of trenches, battles, courageous attacks or heroic fighting – cannot be seen in them. Almost everything is happening beyond the front line, or even, deep down there in the resource and support base. We would find it difficult to class most of those pictures as a reportage. But, aren’t we too demanding at this point? The low-sensitivity photographic materials, glass films, and the heavy cumbersome equipment didn’t make it possible to take ‘fast’ pictures. Oskar Barnack was only building his 35mm celluloid-film Leica camera, so that it could enter the very next international armed conflict together with her sister 35mm cameras. Photojournalists of the WW1 time often had to arrange darkrooms, photographic laboratories in frontline Blockhauses for themselves. Besides, a soldier in a front line armed with a camera looked somewhat suspicious. And this is why groups of men wearing uniforms, of various ranks and nations, looking straight at the lens or background is the most popular form of a photographic documentary. 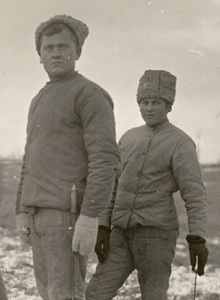 Kotik took his pictures in the southern outskirts of the Austrian-Hungarian monarchy, including terrains which fell under the k.u.k. Monarchy’s influence only during the warfare time. The variety of situations photographed is remarkable. So, you can see civilians: children; Albanian peasants in their farmyards; Hungarian conscripts standing in a square in Kisvarda, southern Hungary, to get inoculated at the moment they are mobilised; other civilians, still wearing their own clothes, but doomed to collect their military uniforms in a moment. Their faces reveal concern, and beside it, interest in the new situation. Other pictures show some Austrians shaking hands with Russian prisoners of war. 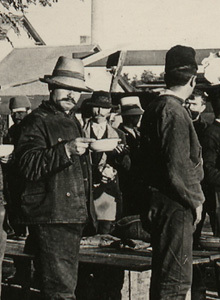 There’s a photograph showing a large group of Russian POWs working at a station; another portrays some Italians having a meal during a stopover. For all of them, the wartime nightmare is well over: their faces are quiet and some of them even crack a smile. Between those two extreme poles of a soldier’s fate, Kotik’s photographs depict a good bit of wartime prose. Somewhere, in a Serbian town, some riflemen are busy arranging piles of wood; in another one, they draw wheat from a store; there’s some trains going along a countryside track. There’s a regimental chancellery and a radiotelegraph operators’ school. The glass films have also recorded some more official scenes: a visit paid by Enver Pasha, the Turish minister of war, or, portraits of high-rank commanders. 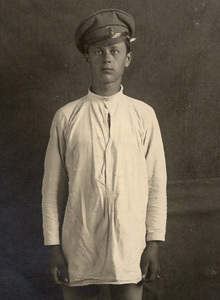 A group of ‘hospital’ photographs tells us more about Kotik himself and his profession. We are offered a collective portrait of the Luxembourg medical faculty’s personnel, the hospitals in Belgrade and Flamm, and even a photographic documentation of an orthopaedic experiment – a portrait of a Russian POW with a leg prosthesis. 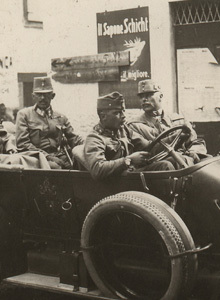 Kotik must have been associated with the Austrian army’s medical services, which allowed him for moving freely enough around the warfare theatre in the Balkans, using his camera in an untrammelled way. 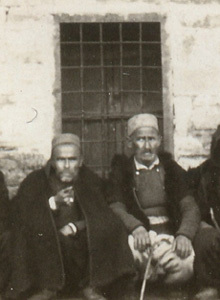 There is an ethnographical thread preserved in the photographs: the pictures of ‘Albanian characters’, as Kotik himself referred to them. The name ‘Albanian’ should be referred to Muslim inhabitants of Serbia, rather than some real Albanians, for the Army of His Imperial Majesty Franz Josef I did not reach as far as into Albania. Yet, Kotik’s photographs show us the Balkan Muslims. Peasants, women or children pose for the photo and don’t seem much happy about it; so, they’d hide under a hut’s eaves. We can see a detail from the homage ceremony paid to the new rulers at Pekinje, somewhere in the south of Serbia. This collection is governed by the rule of chance. Kotik acted on impulse: having spotted something interesting, he would trigger the shutter. When making a portrait, he would assume the role of a frame creator, forcing the events – something fetched far away from documenting. It is those unset photos, scenes caught on the spot, are the collection’s most precious items. The Kotik collection consists of individual images of the war, documenting mutually separate events. These photographs are very static, if not majestic. There is no dynamism in them, otherwise so characteristic to war images. The war simply did not fit into Jan Kotik’s frames.